by Daniel Keever on December 3, 2018 . So you want to create a killer SEO strategy? If you’re somewhat familiar with SEO, what you probably mean is “I want a steady stream of leads without always needing to advertise.” After all, the point of SEO is not just what we like to call “vanity metrics” – pageviews, time on site, or bounce rate. The goal of SEO is business growth. Lead generation. Right? But yes, the idea behind SEO is that as you grow in pageviews and other digital metrics, it should translate into more money in your pocket one way or another. We agree. If your SEO strategy has the right goals and the right tactics, this should be the result. Most people we work with have the same problem with SEO – they’re much better at whatever they do than they are at SEO. After all, they’ve spent years specializing in something else: home services, medical services, tech products, real estate, and more. SEO can seem like a tall task when you try and jump into the technical jargon right away. So let’s start with concept. Google uses an algorithm – a decision-making code – that takes in tons of information to decide what information to show someone who searches for something. For example, when you search for a good burger joint, how does Google know what to show you? How does it know which ones are the most popular or trustworthy? Their decision-making algorithm decides this. 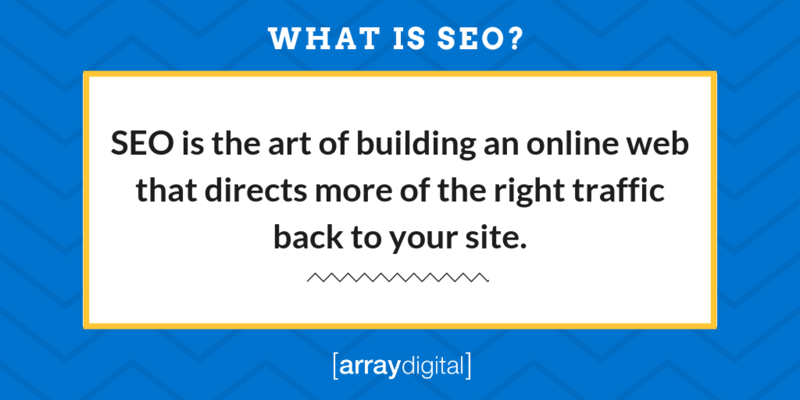 SEO is the art of building an online web that directs more of the right traffic back to your site. 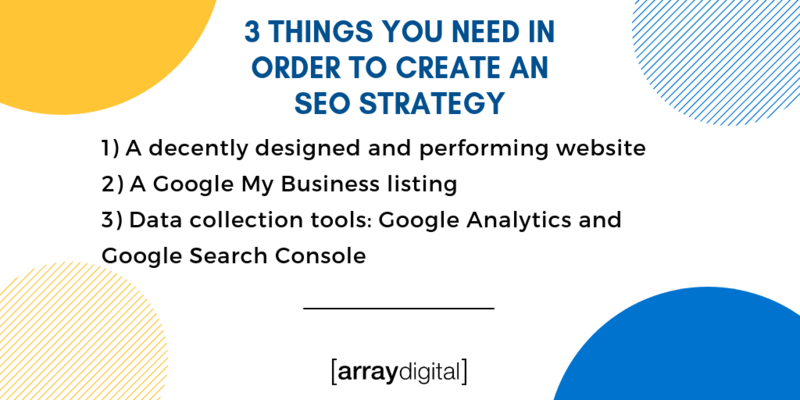 We will go over each major element of a strong SEO web below, but as you build up your online presence correctly, you get more targeted people coming to your website. The end goal of SEO is to navigate Google’s decision-making to get in front of your ideal prospect when it matters most. When people search for a new product, a service, or an event, you want to be the first option that comes up to meet them. You get in front of more prospects, you get more leads. Sound good? Before we dive into the nitty-gritty of building your winning SEO strategy, we want to show you a roadmap of the whole journey so you can understand the purpose of each step more clearly. From concept to execution, skipping ahead will hinder your performance. It’s important to make sure your strategy has the right tools and assets set up. Otherwise, your growth ceiling will be lower. Let’s not do it that way, okay? For this guide, let’s keep it simple. There’s only a few things you really need. The first one, quite obviously, is a website. If you don’t have a place to drive your traffic and convert them, SEO is kind of off the table. But it’s important to note that not all websites are created equal. In today’s digital-driven world, “just having” a website won’t cut it. It needs to be professional, clean, fast, and easy to navigate. Whatever your plan, just make sure you have a website that is an impressive representation of who you are and what you do. This will be your home base. The second asset we recommend is setting up or claiming your Google My Business listing. 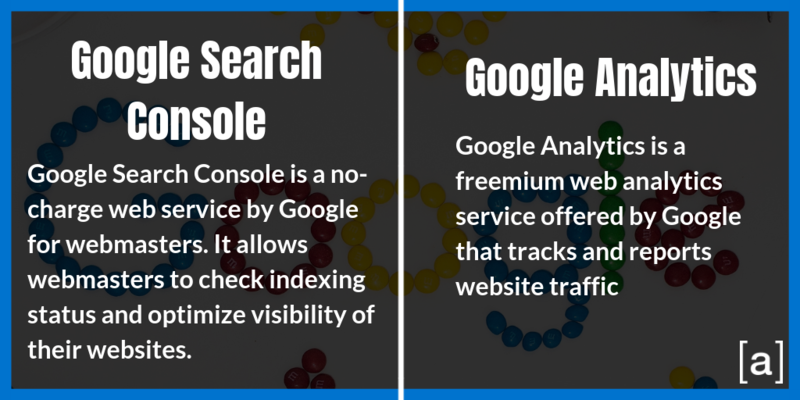 This is one of the most underestimated secrets for SEO. In Google’s more recent UX updates, they actually prioritize their local listings over general link results, a huge bonus for smaller businesses trying to find a way to compete with industry giants. By setting up your listing and filling out all the information, you will take a significant step in boosting your website traffic and brand recognition. But we’ll get to the strategy on how to do that in a minute. If these tasks are a little bit too technical for you, we recommend getting some form of professional help, as they are essential to your SEO strategy. Once these are set up, you’ll be able to know key items like where most of your traffic is going, what people are searching to find you, and more! 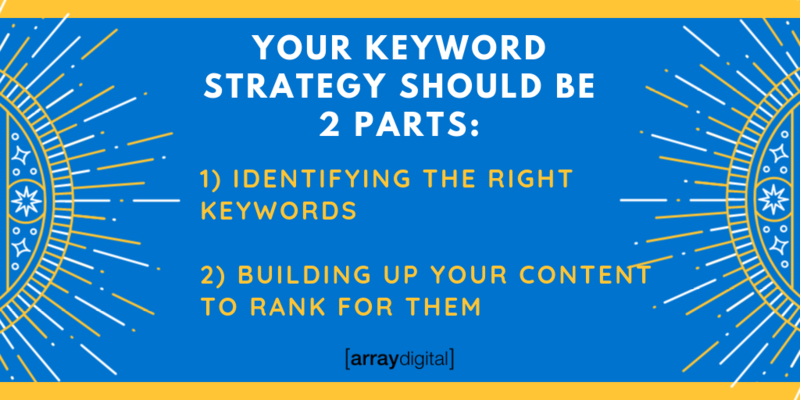 So your keyword strategy needs to be two parts – identifying the right keywords and building up your content to rank for them. 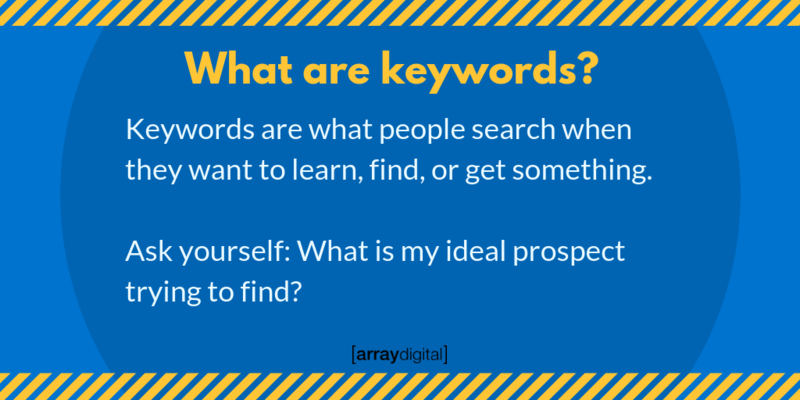 Validate your great ideas for your keywords with real data, then get to work on your content marketing! Successful content writing is partially art and the other part science. The best content marketing does require some creative juices, but you don’t need to be “a creative” to do well here. As we just discussed identifying the best keywords to target, you now need to create content to drive these searchers to. But the key is that if your content strategy is not optimized for search, it really doesn’t matter how good you think you articles and media are. No one will find it! So our first recommendation for SEO content marketing is to start with your core pages – your homepage, your services, etc. You’ll want to make sure these are optimized for your core keywords. 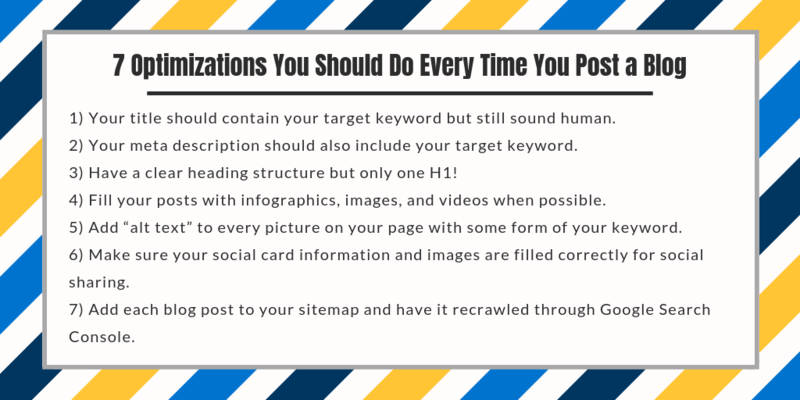 (See our optimization checklist below!) Once your core pages are optimized, we recommend starting a blog. A blog is not just a place for you to share your thoughts with the world. It’s your way of putting out content that will climb the search rankings and answer more and more questions, bringing more and more traffic to your page. Your preview snippet (or title) should contain your target keyword but still sound human. Your meta description should also include your target keyword, but it should also be interesting enough to make someone want to click to find out more. Have a clear heading structure (only one H1 though!) that includes the keyword you are focusing on from different angles. Fill your posts with infographics, images, and videos when possible to help make it more scroller-friendly. Add “alt text” to every picture you put on your page that includes a description of the image with some form of your keyword. Make sure your social card information and images are filled correctly for social sharing. Add each blog post to your sitemap and have it recrawled through Google Search Console. The final core step of your SEO building campaign is called backlinking. A backlink is really just when someone from another website puts a link back to your website on their page. Think of it as them “referencing” you and your brand or content. Backlinks are important for two reasons. The first might be kind of obvious. If you have a network of websites linking back to you, you’re going to get more traffic as your potential reach increases. Big win! But backlinking is also incredibly important in light of Google’s recent algorithm updates, specifically beginning with Google’s PageRank. Described by Google as a voting system, PageRank began to take the number of backlinks into account when deciding how trustworthy a website was. The higher the trust, the higher the rankings in Google’s search engine. But as this began getting abused by “blackhat SEO” (people literally created thousands of fake websites to give themselves backlinks), Google decided to not make all backlinks build your rankings. In fact, now backlinks from websites deemed suspicious actually hurt your rankings! 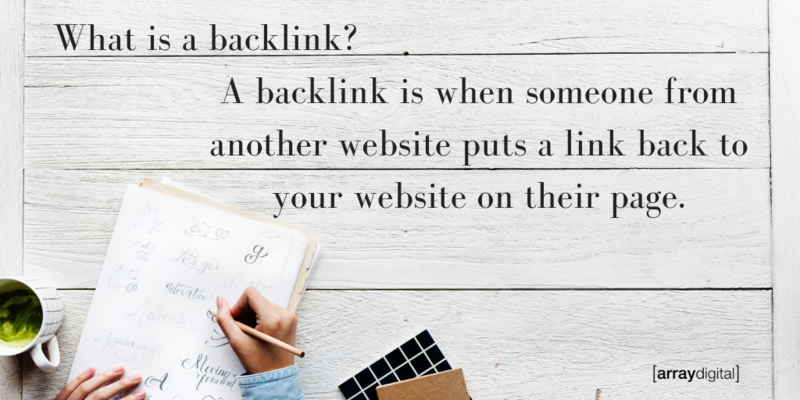 So the goal of backlinking is not just to get a ton of backlinks, but it’s to get them from reputable sites. Just think of backlinking like networking. You want to provide value to people, hoping they refer you to their contacts. If you’re just starting out, we recommend that you look for prominent industry blogs, news publications, and other common ground resources that are decently popular in your industry or geography to get backlinks. There are great tools out there to help you with backlinking further down the road as your efforts grow in scale. 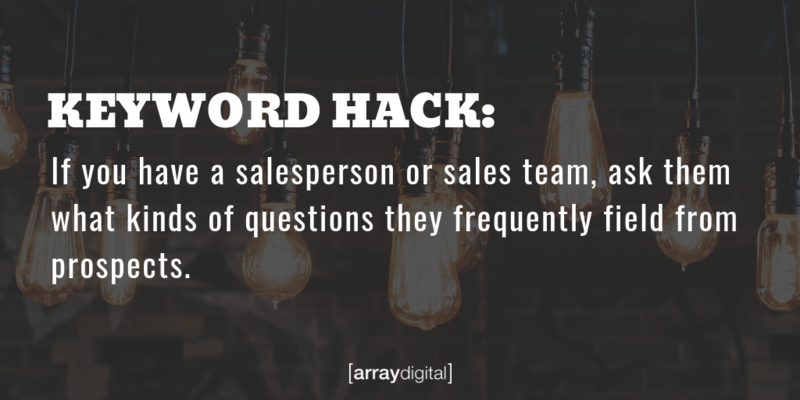 At Array Digital, we use SEMRush, which we love, but there are also tools like Moz and Ahrefs that provide similar services. If you’re just starting to really dig into SEO, you need to understand one key fact: SEO is a long term investment. The ultimate goal is to generate a steady stream of “organic leads” or leads from traffic you aren’t buying ads to acquire. It takes time, and you need to steadily build it up – meaning be patient. If you desperately need growth now, we recommend advertising, but if you’re at a place where you are planning on long term growth, we absolutely recommend SEO. If you’re not sure you want to devote all of the time required for a successful SEO strategy (research > copywriting > graphic design > frequent optimization > backlink building), just know you aren’t the only one. Lot’s of companies, including many of the most successful, established ones, found success in partnering with agencies to build this up. Agencies provide a significant boost by providing an entire team of specialized experts for a much more cost-efficient price than a full time employee or staff. If you need help with your SEO but don’t know where to start, let’s chat!